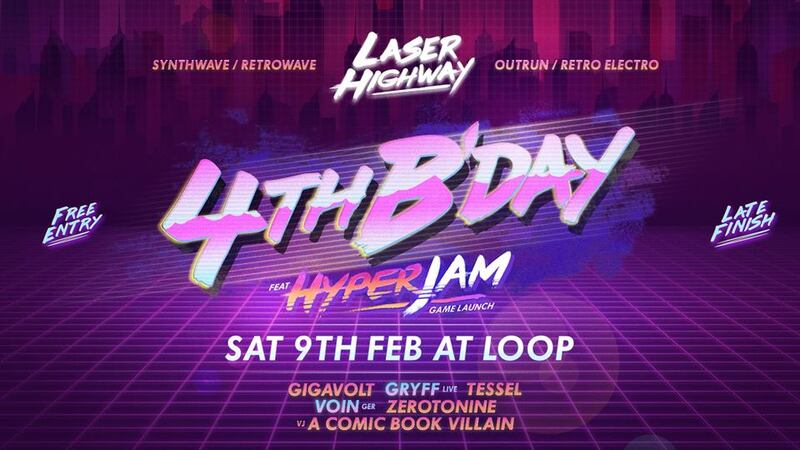 Laser Highway’s 4th Birthday feat. Hyper Jam Game Launch! You are radically invited to the 4th anniversary party for Melbourne’s mecca of synthwave culture, and 48th monthly event in a row of sheer sonic and sight delights from the retro future. We’re bringing back a bunch of heavy hitters to look after aural entertainment, and by popular demand we’re happy to host BitDragon Games as they launch their cyberpunk set 4-player competitive shooter/brawler with a full retrowave soundtrack, Hyper Jam! Listening to Brisbane multi-talent Gryff is like sipping the perfect cocktail – it’s refreshing, it goes down smoothly but it still packs a punch. Transporting listeners to a 1980’s Miami wonderland, Gryff melts vivid, synth-pop with soaring vocal delivery. On the cusp of releasing his debut album ‘Calypso Drip’, Gryff continues his conquering of tropical synth-pop by creating music that is soaked in nostalgia yet still feels crisp, fresh and completely new. It’s a modern-sounding love letter to the glory moments of decades past, pink sunsets and all.His 2018’s track ‘Jessie’ scored him a #1 spot in Reddit’s ‘Outrun’ channel, as well as features on New Retro Wave’s sister channels. He is working on his debut album ‘Calypso Drip’ as well as collaborations in 2019 with Kalax, Jordan F, Moonraccon, Icarus, Turbo Knight and more. Gryff’s influences include 70s/80s Synthpop/Funk/Disco such as Phil Collins and Hall & Oates with modern synthwave influences including Ollie Wride, The Midnight and Robert Parker. Tessel is a DJ and designer inspired by all things Outrun, Cyberpunk, fast cars and outer space. He’ll bring an eclectic mix of everything cyberpunk and outrun to the mixtable, crank some pounding beats and trippy soundscapes.